NETWORK FINALS: The season finale of SHARK TANK and 48 HOURS: NCIS each gained 0.1 in final numbers, but both THE ORIGINALS and REIGN fell the same. CABLE HIGHLIGHTS: ESPN dominated Friday cable with 1.59 for its NBA PLAYOFFS game, while NBC Sports Net’s NHL PLAYOFFS game was at 0.31. HBO’s REAL TIME WITH BILL MAHER ticked down to 0.41, and ANIMALS was down 0.02 to 0.08. 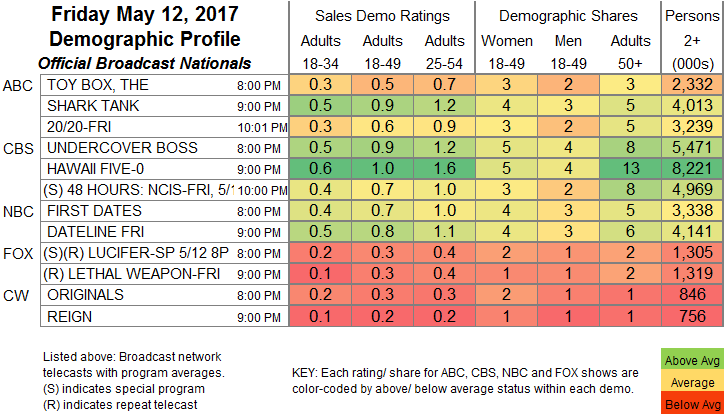 A&E’s LIVE PD fell 0.08 to 0.40. Nickelodeon’s 12:30PM PAW PATROL hit the Top 10 at 0.39, with lead-out RUSTY RIVETS at 0.27. On VH1, RUPAUL’S DRAG RACE rose 0.04 to 0.37. MSNBC again had THE RACHEL MADDOW SHOW in the Top 10 at 0.32/2.5M. 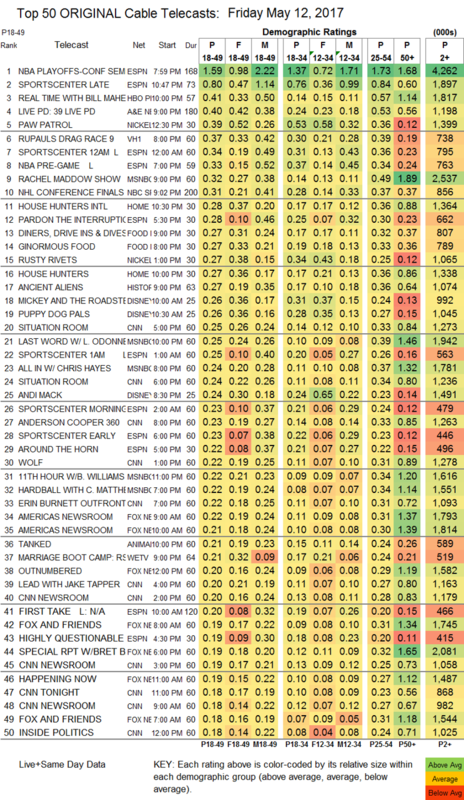 On HGTV, HOUSE HUNTERS INTL climbed 0.04 to 0.28, and HOUSE HUNTERS was at 0.27. On Food Network, DINERS, DRIVE-INS & DIVES returned at 0.27, and GINORMOUS FOOD was steady at 0.27. History’s ANCIENT ALIENS ticked up to 0.27. Disney Channel’s morning MICKEY & THE ROADSTER and PUPPY DOG PALS were both at 0.26, the latter steady with last week. On We, MARRIAGE BOOT CAMP slipped 0.02 to 0.21. Discovery’s YUKON MEN lost 0.03 to 0.17. The second night of TNT’s AMERICAN RACE was at 0.11/0.08.